One more step, just one more step. This story started several years ago. 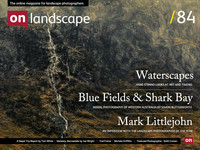 An email arrived out of the blue: 'My boss has seen your pictures in a magazine and was wondering if you do workshops? He lives in Sydney and is coming over to Europe to see friends and would like to spend a week with you'. I didn't want the responsibility of professionally providing good photography and everything that entails, but I did sense an opportunity which seemed too good to pass up. Inspired by the 'non workshop workshops' of a certain Mr D Clapp, I suggested instead that we do a location swap. I would provide accommodation, local knowledge and tuition as required in return for similar at an unspecified time in Australia. Waiting nervously at the arrivals gate in Edinburgh airport I clutched a sign with Rob's name on it. The enormity of what I had set in train had only started to sink in a couple of days earlier. I figured an Australian was a good bet when it came to getting along together - but what if we didn't? I scrutinised each person emerging from the gates and silently implored to some higher deity...'please, please, please don't let that be him!' Eventually a fit looking guy strode purposefully towards me, grabbing my hand in an iron grip he drawled 'Rob, pleased to meet yer mate'. A big thanks to Simon Butterworth for this beautiful trip report. If you want to see more of Simon Butterworth's photography, please visit his webiste - simonbutterworthphotography.com.